Play back high-quality digital audio. Easily add audio playlists to your presentations. Synchronize audio with video playback. 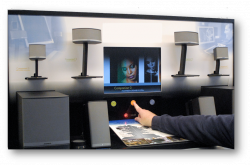 Create and play interactive retail audio product demonstrations.